Download Twitter archive and download tweets starting from your first tweet. Twitter is one of the most popular networks platforms allowing user to share tweets and rich content itch their follower around the world. Twitter users have the option of downloading all tweets from twitter. Twitter is one of the most popular social network enabling easy transfer of information across the Internet. If you want to download all tweets and download twitter archive, twitter offers a convenient option to download twitter account. If you want to download twitter archive, follow the simple steps outlined below. 1. Log into your Twitter account. Navigate to the Twitter Settings page (See link below). 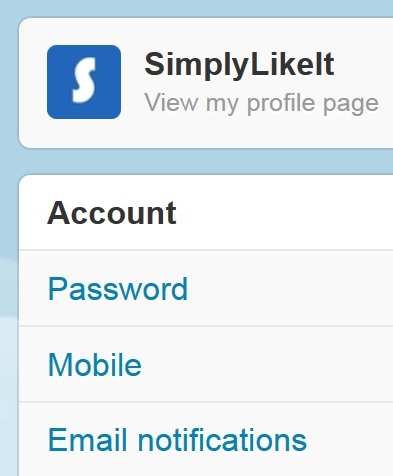 In the Twitter Account Settings, click on Account tab. 2. Scroll down to Your Twitter archive section. Click on the Request your archive. 3. Look for an email from Twitter. 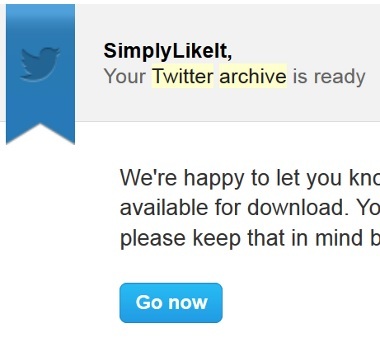 Twitter will provide a link to download Twitter archive. Click on Go now that will enable you to download Twitter archive through a zip folder. 4. Unzip the zip folder. Open the spreadsheet named tweets. Twitter will display Twitter archive that contains various columns like the tweet_id, in_reply_to_status_id, in_reply_to_user_id, retweeted_status_id, retweeted_status_user_id, timestamp, source, text, expanded_urls . Twitter is a popular social network that helps users transfer short tweets of 140 characters around the world. The ability to tweet from multiple vehicles Ike smartphones, etc. has made twitter ubiquitous and convenient for users who want to share their interesting thought with their friends and family. Twitter provides a feature enabling users to follow other users and this is one of the most popular features of twitter and one of the most important reasons twitter has catapulted to popularity. As a vibrant social network, Twitter allows users to download tweets and download twitter account through twitter settings. Twitter settings enables users to request twitter archive of their account containing all their tweets. Once twitter users request to download twitter archive, twitter will email users their entire account of tweets in a zip file. The zip file will contain all tweets and users can download twitter archive if users are interested in retaining their twitter account and twitter tweets in a file format.